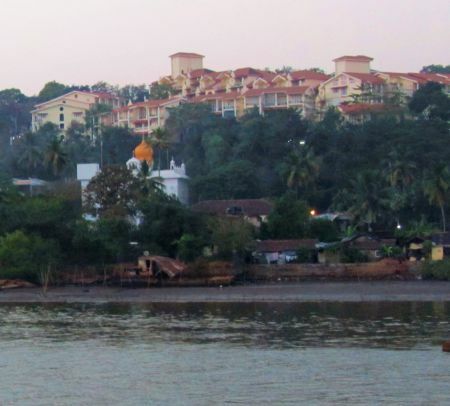 During our stay we arranged to take a Sunset Cruise that featured a Goan dance troupe performing a program, for our cultural entertainment, of folk and religious dances with traditional dress. One of the dances was the Portuguese peasant dance, unsurprisingly spanish-influenced. It was still daylight when we got on the boat for departure, so there was a chance for a little sightseeing before the sun went down. If memory serves, the palatial tile-topped building in the skyline in the photo below is the Baga Marina Beach Resort Hotel. There’s also a church and a dome-topped orange temple, and you can see what appears to be homes along the edge of the river. We passed several boats that were mostly dark like the one we were on. This boat seemed to be a more glamorous casino-type cruise with lights flashing, but whenever we passed by I didn’t see many people about. 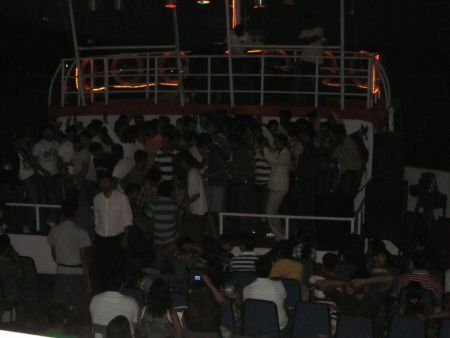 Maybe the liquor on the lighted boat was better and everybody had already passed out on the lower decks. Or maybe the big spenders were just being tight that evening. I wanted to show you this picture, (below) because it illustrates what I’ve said several times how you should always walk in India with your eyes cast downward to where you’re walking. Imagine if you were walking down this street on a dark night, maybe to drink a few bottles of Kingfisher (beer) at Molly Malone’s. And let’s say that there are parked cars, and other cars passing you on your left, and you decide to move to your right to avoid the traffic. One minute you’re on solid land, the next minute you’re stepping into an abyss. An accident just waiting to happen. That’s exactly what I did trying to avoid the traffic and ended up in the drainage ditch in the picture below. It doesn’t look very deep, but I’m sure it’s about 24 inches deep at least. What a thing to happen not even half way into our trip. I had a cut in my hand, dug some glass out in the bathroom of the restaurant we were going to, and a purple/black bruise from my hip to my knee. It only faded completely a couple of weeks after I returned home. There’s no such thing as a hazard warning for pedestrians. But this accident was one that waited for me! By the way, the dogs usually lie in the streets. I asked Hubby why they lie in the streets where, by the looks of all those limping around on three legs, they’re being run over or killed. Because they don’t belong to anyone, he said, they’re fed or get their food from whatever they can find around town and on the beaches. Sometimes families will take turns feeding them, but if they go into a yard to rest they’re shushed away by the property owner. So if they’re not on the beaches, they’re in town. 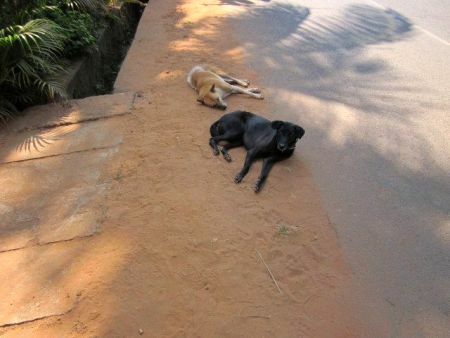 The only place they can rest is on the street. There are hundreds of these pye dogs, which literally means “ownerless half-wild Asian dog,” around. They’re very docile, but I try very hard not to look at them because they seem so sad. I think how horrible it would be to go through life with no one to care for and love you, and there’s not a damn thing I can do about it. If ML had not taken this picture, I would not have had the only photo to remember my infamous fall at Goa. That and the bruise deep inside my thigh that I still feel two month later. The next post will feature a close-up look at the Madagoan Railway Station and the train that takes us southward to Kochi. Hope you’ll join me. This entry was posted in International Travel, musing and tagged Bollywood, Calangute, Florida, Goa, India, Key West, Molly Malone, Panaji by Alice. Bookmark the permalink. That Molly Malone turns up everywhere! Had she no Guinness to go with her cockles and mussels? LOL. Hope the bruises are well healed and forgotten about by now. Given that Goa has a close to 120 kms. coastline one would expect to be able to see it on drives, but rarely so. 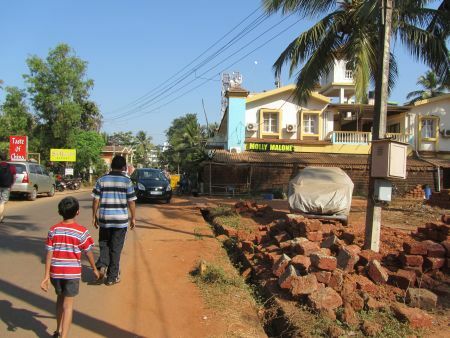 Much of the Goan coastline is populated, usually sparsely, save town centres, by villages home to fishermen or otherwise. Roads are built further away. And most of those villages came up along the coastline long before roads became a key means of transportation. That the homes along the coastline and the roads further away makes complete sense, Anil. And the villages and town centers are no less colorful and interesting. I see from your blogsite that your “hometown” was Goa. I don’t know how you ever managed to leave it. I think it’s one of my favorite places in India now; no wonder hippies loved it so. So very sorry about your fall. One advantage of walking hand in hand with G, is that I have a safety line. I can’t ever see where I am going, so G saves me all the time. G’s mom encountered something like that in Tijuana. A hole in a sidewalk she didn’t see, kapow, and broken ribs. I so hope you broke nothing. As I picked myself up, I was truly astonished that everything seemed to work okay, but I couldn’t have climbed out of that hold without the helpings hands of Hubby and S-I-L. My glasses were askew, but they didn’t break either–miraculous since I didn’t have a spare with me. I’m doing fine now, though. So sad about those dogs! Good to know Raghu! Next time! I’ll have to check my Goa church/temple file to see what I come up with. So many churches didn’t allow pictures inside. And I’m all that eager to get on that train again–! The aftermath of Katrina and the subsequent Federal Flood has made stories about animals to me the most distressing. When we returned from evacuation dogs ran the streets wild-eyed still holding the terror of what they saw and unable to get back to being man’s best friend. Maybe they were mad, mad at the man who left them behind to endure such devastation. I’ve been working on a project for the historic bridges that cross the bayou here and started a blog for the ReBridge effort and recently have been asking for Bridge Stories and this one really touched my heart – http://nolabayoubridges.wordpress.com/2011/04/22/107/ – it’s from my neighbor Henry who I met after the storm and who I thought’s name was Rex too for a long time! PETA thinks its horrible that we have domesticated these animals that now rely on the kindness of humans to survive – perhaps they’re right. When I look around the house at all the lazy animals waiting for me to fill their bowl I wonder to myself if I’m not the one who is “owned”.